On Saturday, May 17, 2014, it was the first time in a decade that the Primera Division had a winner that wasn’t Real Madrid or Barcelona. No, it was Atletico Madrid instead; a fairytale story. The season before, Diego Simeone’s men battled Real Madrid for the Copa del Rey and won at the Santiago Bernabeu. A year later, they found themselves at the Camp Nou: League Winners. From the start of the match, Atletico were up for it, but when injuries to Diego Costa and Arda Turan came in the first 25 minutes, Atleti supporters were starting to doubt a positive result. Win or lose this match, Atletico were set to face Real Madrid for the UEFA Champions League title in Lisbon. A European Cup final was to be won in addition to Spanish football’s top flight crown, but here were Atleti’s supporters at the Camp Nou, watching their side lose two key players with the LaLiga title on the line. As it happened, an Alexis Sanchez opener would be answered by a Diego Godin header four minutes into the second half. By the 90th minute, the main theme of the tactical battle was still the same – Atleti would prioritize pushing play out wide, overloading Barca’s rotations and the Catalans would try, via Lionel Messi and Dani Alves’ magic, to break down Simeone’s elite ‘bus.’ Ultimately, the score would stay 1-1 and Atleti were the kings of Spain. Given that this is a throwback analysis, a few things stood out beyond the initial football battle. As an analyst who has watched Atletico over the past five years, this playback was a fun one. The difference in Atleti’s transformation from a low-block behemoth with two world class strikers to the tactically versatile juggernaut with players who can’t finish was fascinating. Atleti are a more dynamic team today, but three years ago they were more one-sided. They were highly effective back then, but definitely more limited in their tactical approaches and technical skill. Barcelona, on the other hand, were interesting, too. Javier Mascherano was in his prime, Dani Alves was a magician and a focal point in Barca’s ‘juego de posicion’, and while Alexis Sanchez didn’t quite fit tactically, he still offered plenty of skill and scored a goal. Messi was still Messi. Per usual, and still is, he was the ‘tactic breaker’ on the day, causing problems when he dropped deep to help the buildup. It was a glorious day: vintage Simeone-era Atletico. 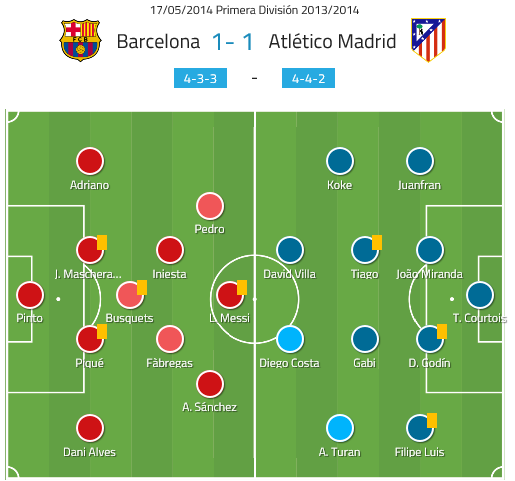 Read on for the tactical breakdown of Atleti’s solid performance. Everything that is good about Atletico Madrid’s transitional play philosophy is seen in the first minute. They set themselves up to attack teams when their opposition is not at their most organized. The video below shows how one-touch or two-touch football is not just essential for a possession-based team. In general, if you want to have a good transitional play squad, you need the technicality. Atleti have it. After they successfully pushed Barca back in their 4-4-2 mid-block, Atleti put together a decent central-direct counter build up. Interestingly, they use a central-possession circle to try and bait Barca’s midfielders away from Gerard Pique and Mascherano. Simeone plays his transitional\defensive style because he respects Barcelona’s and Real Madrid’s world-class players. Why try and play out from the back against Barcelona when a mistake at the back is usually going to result in a goal against you? Logically, Atletico went for the long ball often. Most people think going long is a quick and direct way negate most of the opposition’s outfield players and attack their defenders directly. This is true, but it also allows hurting a team with a good counter-press (which Barca had). If one of Barca’s strengths is to win the ball back quickly in their opposition’s defensive third, then why try and play out the back and help that strength? Go long and eliminate their counter-press entirely. Watch below. Los Rojiblancos are a team that likes to overload the opposition’s right flank, throw numbers into the left side of their formation, and causes problems by pulling players out of position and throwing in crosses to unorganized blocks. Filipe Luis’ ability to go forward, win 1v1s, and offer quick, one-touch passing is another reason why Atleti likes to attack down the left side of their formation. The video below shows how Atleti did this constantly against Gerardo Martino’s side. Today, Neymar is the player that gets the most attention from opposing defenses. The Brazilian’s ability and effectiveness in dribbling has surpassed Messi’s. This is probably because Messi is more of a playmaker now. Anyway, in the 13/14 season, Messi was still the guy you needed to double mark or triple mark. The screenshot below shows how Messi was dealt with by Gabi and Tiago. The next image shows how three Atleti players surround Messi and how Raul Garcia leaves Alves open on the right to join the triple mark on Messi. Furthermore, the screenshot below also shows Atleti drop into a right-sided 3-2-2 to deal with a Barca overload down the right. Once the Brazilian star was subbed in, Barcelona attacked from the left more and did so in a narrower set up. Alves, on the other hand, stayed very wide down the right so when the ball was switched over to him, Atleti, who were very narrow as a result of Barca’s compact attacking shape, had to cover more distance to get to him. Alves mostly whipped in crosses after the receiving the ball due to Atleti putting eight or nine players into the penalty box and half-space upon the switch. In terms of goals, Sanchez’s opener was the result of sublime accuracy and power while Godin’s equalizing header was the result of poor set-piece defending from the Catalans. Regardless, Atleti kept Barca’s attack at bay and really showed their world class defensive cohesion and ability to transition well in attack. In the end, Simeone’s outfit battled during the 13/14 LaLiga season and overcame Spanish football’s duopoly. Sure, Atleti are a more complete team now, but back then they managed to utilize their strengths – defending and set-pieces – and exploit their opponents weaknesses. Perhaps Atleti can do this again as Simeone will see his Madrid side into the new stadium for the 17/18 season.